The student who tripled her account and make US$120k in 5 short months! I enjoyed a lunch treat from my June 2013 batch student, Cindy Qian today! After attending our June investment course <Passive Income Mastery Programme>, she tripled her account size from a total investment of $60k to $180k in 5 months time! By the way, she started off with $5k initial capital, and top up the capital only halfway through. In total she makes a net profit of $120k including commission expense from $60k. And she don't even know how to read Technical Charts. 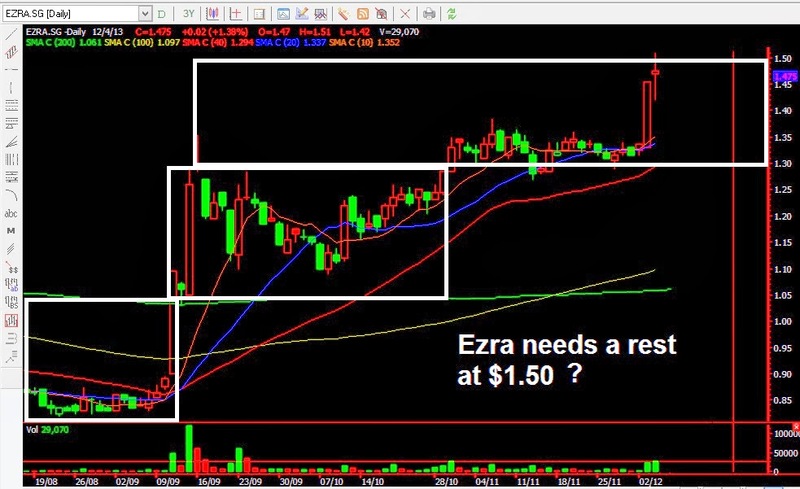 Who says investment trading needs charts?! Makes my day to know how much she earns consistently every month! By the way <Passive Income Mastery Programme> is an investment programme to help people who wants to enjoy a consistent income from the stock market using stocks and options! If you want to know more about how she did it, join our weekly preview seminars to find out her strategies! 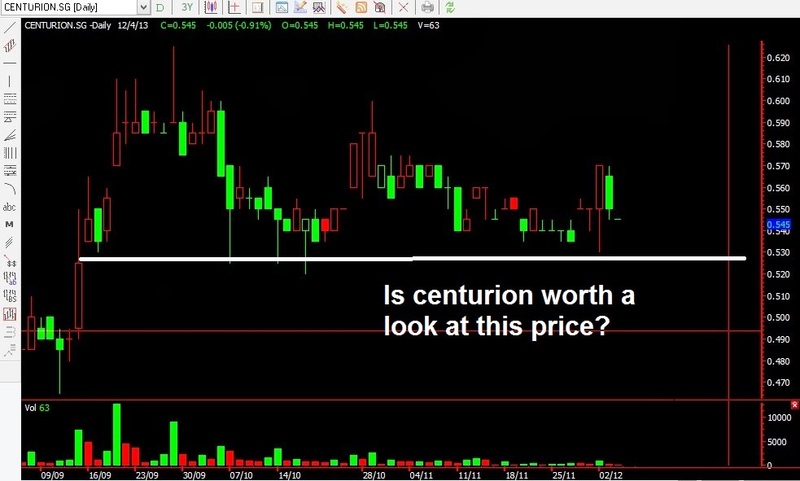 Recently Daniel Loh predicted STI may bottom at 3000-3050 region! STI reached 3025 lowest before rebounding to 3150 now! Will STI become the best performing index in Asia before Chinese New Year? Do come to his seminar to find out what he thinks and what stocks to watch out for! 3) What are the stocks you should look at in Jan? I am asked to comment live in studio with another analyst to give our views on the reversal of the local stock market, the US all time high run-up, the Nikkei bullishness, the sectors that may be in play at 7.48am. 20 minutes session with live call-in. If you want to know more about the market direction, tune in to your television, Channel 8. Wonderful triple digit move up is fueling the christmas rally! With the triple digit move up for the dow, it just seems this christmas rally is going in full steam. It just can't seem to end here. One thing is for sure, things are now back to normal where we will scrutinize the economical reports and the earnings announcements of the companies again next january. If is any fall in expectations in the ISM and non farm payment report, do expect the market to go weak. And this time round, there is a chance that actual results may be less than what analysts think after the end of holiday season. Although I feel that employment data may be ok, I would really suspect why the ISM would be able to post another figure like this month. With the holiday season over, I think ISM might start to slow down. Enterprises normally goes weaker in december or january as production has already start to slow a bit. Apart from the economical reports, all eyes will be on the last quarter earnings of US stocks. With the recent rally, there might be some stocks that fall below expectations. In summary, I do feel that january or february may not be easy months for US market. If you are dabbling in US, I suggest moving your funds back to south east asia. Next quarter, I think the SEA might outperform US market. STI might become the best performing index in Asia before CNY! Some have asked why we have not updated our blog as often about the local market. Because these few weeks it has been really bad. There isn't many stocks for us to pick. If you have taken note about our article, we mentioned that we should start to accumulate some Singapore stocks in the region 3000-3050. If it drop somemore, 2950 should be the lowest. Recently STI hit the lowest point at 3025 on the 12th December. It is within what we called the accumulation zone. In recent interviews in FM958 and Channel 8, we did mention that we should accumulate the good stocks or STI component stocks first. We do think that Singapore market is finally seeing a bottom and bullish momentum is definitely growing. Judging by the analysis on the market, we also see good potential in mid cap and of course the dreaded penny stocks recently! Do not think that it is not possible that Penny stocks might be coming back with a vengeance. We already see some stocks brewing up. With the QE tapering confusion episode over, I think the selling of STI stocks might be over. We think that that might be a strong rally ahead before Chinese New Year next year. Let us get ready and be prepared! We shall update you on more singapore stocks analysis soon! We are excited now! And remember, once the momentum goes into full strength, be careful of shorting any stocks. What a surprising reaction about the taper! DOW 300 points!? Yesterday I did mention that I have a hunch that the market will rally. But I am wrong when I mentioned that there might not be a taper. In fact the market rallied because of the taper! There is a $10 billion surprise tapering. How the market react to this has been amazing, given the fact that worries has been surrounding the taper. The only explanation would be that the taper is minor, as what Ben Bernanke says, "The tapering is modest". And it would be in small steps. Like what I always says, the market seem to like this Botak Ben so much! I guess, no matter what decision he make today, he should be able to deal with it smoothly and ensure that the stock market continues to function as what he wants, up, up, and up! I am his fan also, as I have always said, he is a market manipulator genius! Without him, the stock market won't be as high as seen now. You are the Best FED Chairman around! No movement today in the US market. It is quiet and calm. All eyes are focused on tomorrow Ben Bernanke's press conference. At 3.46am local time, Dow is currently down by 1 point, Nasdaq is unchanged and S&P500 is down by 4 points. Currently we are also taking a quiet stand by the side waiting for the results. Like what we mentioned in the past, we don't expect an announcement in tapering tomorrow. However we know that any hint about a tapering decision soon next quarter will also trigger a selldown. But somehow or rather, I have a feeling (just a feeling) Ben Bernanke will do well not to suggest any hints of tapering with the low inflation figures. Free Seminar by Andy Yew: What are the Hong Kong and Singapore Stocks to look at NOW? US Stock Watch: Facebook just keeps getting better! Recently Facebook did correct itself. It went from a high of $54 to a low of $43. But we did say that it is a retirement stock that you should HOLD LONG TERM! Today, it was announced that Facebook will become a S&P500 and S&P100 stock. Today it gaps up again. I have NO DOUBTS that in the nearby future, it will become a Nasdaq 100 stock! And that means MORE buying from hedge funds and institutions! The definition of a Retirement stock to me means 10 years down the road, Don't Sell! In its journey, Facebook will definitely face the prospect of a few bad quarters that will pull the stock back hard as it is riding strongly. Do remember that Google went to $700 before falling to $400. But now it is $1000 plus. Baidu when to $1500, before falling to $1000. Now Baidu is a $1800 stock. It is $180 now because it declares a 10 for 1 split. Treat it as a Warren Buffet's portfolio stock. INVEST like him. Let me borrow a quote from our legendary investor. Do not ask us if you need to cut loss because with this stock, there is no need for stop loss for a stock that has potential to grow 10 times. You just need to accumulate. Save $100 every month, and buy when the stock dips 10-20% is my advice. 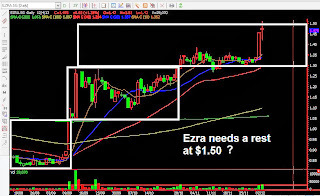 We did say that EZRA needs a rest these few days when it reached $1.50. Indeed these few days it consolidated. Now the price is $1.44. Whenever a stock consolidate, I like to observe its behaviour. After observing it, I do think that it has a good , chance of breaking $1.50, when STI recovers. Hence, I would remove the selling status, observe very carefully to look out of a upside run. Do watch out for this stock! Not advisable to take action now as market is falling, but rest assure that this stock is in my radar! Free Seminar by Andy Yew: Will STI show reversal soon? Another 30 points drop in STI today! When will this stop? A Million dollar question in the mind of many singaporeans is when will STI drop stop. I am looking in this region, 3000-3050 as the support of STI. If STI is in this region, I would be going in to pick up some stocks to test the water! If it goes up, I would accumulate somemore. If STI drops further to 2950, I would add on my positions! I think 2950 might be the lowest point should it drop there. Would update more on our views of STI. Free Seminar: Danger Signs to watch out for in 2014! These 5 months, Daniel Loh have correctly predicted STI top at 3300, STI bottom at 3000, Aussie dollars strengthening at 0.89, KLCI bottom at 1700, Jakarta bottom at 4000, Nikkei top at 16000, Nikkei bottom at 12800, Shanghai recent bottom at 2100. My take on "Will FED taper this year in december?" I am asked many times by the media and investors about this question. My view is nope. Not so soon, not in december. Knowing the character of Big Ben, still the FED chief, he is the KING of understanding market psychology. If there is a tapering, he would give a warning first, one or a few months before the tapering actually might occur because he wants to lessen the impact of the taper. That is what happens in May this year, remember? At that time, I seriously think that he has considered tapering in October. But because of the government shutdown and the bad employment reports and the debt ceiling uncertainty, he abandoned the idea. This caused the market to reach all time high again! So I feel that being the DADDY of WALLSTREET, he won't let us down by declaring a Sudden QE tapering. He knows this sudden decision will crash the market. I am sure he wants to walk off as the man who brings the market to all time high instead of leaving on a poor note. But with that note, I feel that there is a chance he might want to announce the possibility of a tapering on the 17th December in the FOMC meeting. If it is so, the market might still fall on any words of a possibility! Just watch out on his speech on this date! That is my sentiment of Wallstreet now. Is good news a good news, or good news is bad? On Friday, US reflects good employment reports. Both the non farm payroll and the unemployment are indeed above expectations. We predicted correctly that this result to be good. But we predicted wrongly that the market may fall due to the good reports. It did not follow the 5 days drop where almost everyday there are good reports that came out. ISM manufacturing did fantastic. So does ADP employment, NEW HOME SALES and Jobless Claims. And that is the reason for the 5 consecutive days drop, right?! Or did I interpret wrongly about the market?? Isn't the concern about the tapering happening soon if reports are good. BUT WHY does the market increase a near 200 points on Friday??? Ha, maybe I should just give up guessing and knowing what the market thinks now, and maybe you should too! Let the market decide its own fate. I am probably sticking to these 3 rules to know if the DOW really goes into a mid term correction. 2) DOW drop in 3 consecutive days. (Indicating short term weakness) This year there is only 3 times where DOW drop for 3 consecutive days. Each time DOW did that, it is the start of a 1000 points drop. 3) DOW drop by 2 consecutive weeks (Indicating mid term weakness). Now probably only the second factor is triggered. Let me see if next week will trigger the others. I am just going to give up predicting the trend now, and let the market tells me!!! - How do you find the next Puncak and YLI? 1) KL Stocks you may see this December? 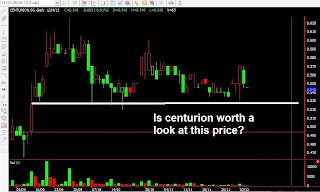 Singapore Stock Watch: Is Centurion still worth a look? Singapore market has been very quiet recently. Big players are having their early Christmas holidays! That is the reason we have been quiet in our commentary in singapore stocks. However there seems to be a stock that is in sideway consolidation. I do feel that if market gets better, it will recover. This may be the stock that is still worth a look. There is a strong support at $0.50. One of the good performing stock these past 2 months has run from $1 to $1.50, an increase of 50%. I know that it did have some good earnings announcement and projects. However I feel that for short term traders, $1.50 is a good point to profit take. This consolidation may last for a few days to weeks. Let us see if it happens. Let us treat this as a case study. A worthwhile price I would look at this stock again is $1.33 and below. $1.40 is small support though. See if it holds there. Making a profit from the Crude run-up these 2 days! Do you still remember we mentioned that Crude is likely to travel in between $90 and $100? Congrats if you long with us. Using our Day trading proprietary strategies, we managed to pocket $15000 overall profits in just 2 short days! I entered to long crude index futures. In just 2 days, we pocketed ($10,620 + $5070) = $15,690 in just 2 days. I do conduct <<Day Trading Mastery Programme>> to a small closed group of individuals. If you are interested to know more, please email me at rafflesbusiness@gmail.com stating your interest. Let me know if you are our past RBI graduate. We will furnish you with more information!